People are farming to manage climate risks, but the risks are getting greater. The biggest thing that I’ve learnt is to be more efficient with our business and watch where all our pennies are going. We now have flexible inputs instead of using a ‘regular’ regime. Now we aim for an average yield, and put what we need on for that output and to maintain our soil health. Dad was 16 when he started working for a farmer. He leased a farm when he was 25, then purchased a small piece of land west of Lake Grace in 1972. He built up from there. I’ve always lived around here. Anna and I moved to south Lake Grace in 1996. 4 years later, the family farm was split. We leased another farm which we then purchased in 2005. Of our 5000 hectares, 3200 hectares are arable and we crop 2000 of them. Earlier, when we were expanding the family farm, we bought another block. It’s 810 hectares, about 12 kilometres east, and is lighter soil. It’s been fairly productive for us. We grow wheat, barley and field peas, some oats, and a bit of hay for my sheep. We mate about 2000 Merino ewes each year; they are a self-replacing flock. Here, there are still a lot of sheep in farming systems. 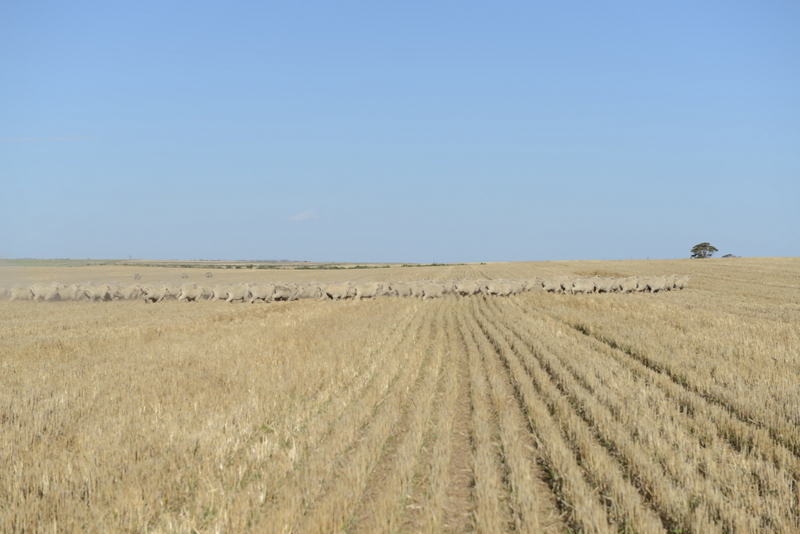 About 30 per cent of people would be cropping-only – the other 70 per cent still have sheep. The rainfall trend in Lake Grace is that it has decreased over the last 30 or 40 years – especially the growing-season rainfall. When I was young, it used to get too wet in June and July. I can remember reseeding because it got too wet and the seeds burst. That was on a regular basis. It was always variable, but now we just don’t get that wet in early winter. And we could always rely on finishing rains – but we never got as much rain in summer as we do now. Less winter rain and more summer rain on a regular basis is annoying when it comes to harvesting – but when it comes to growing crops, we need more moisture in the growing season. When I first came home from school, we used to start harvesting around my birthday – never before 10 November. But our crops are ripening 2 to 3 weeks earlier than they ever used to. Now we get going in late October: that’s purely because of temperature trends. Our extremes have been a lot more variable, too – I’ve noticed it more in the last 2 years [2013-14]. Our thunderstorms this year  have brought a lot more hail damage. The hot times are getting hotter. We also get hot winds earlier in the season that ripen the crops earlier, so we miss out on some potential yield. I think the frosts are probably more severe, too. In 2013 and 2014, we were lucky and didn’t get many frosts. But before that, we had a bad run for a few years, where the frosts really nailed us in 2008 and 2012. This country is fairly sheltered, so we don’t get as frosted here – which is a good thing – but we also need more water to grow equivalent crops than lighter country. We’ve got quite heavy soil here – it’s a loamy clay, which needs a fair bit of rain. With the systems that we’ve got now, if we can get 100 mm of rain for the growing season, we can grow a crop that will give us a bit of a return. This year  we had in excess of 200 mm for the growing season and another 150 mm for harvest – it’s been great. Our other 2000-acre block, about 12 kilometres further east, has lighter soil and is also very productive. I think everyone’s getting better at farming to manage risk – whether that’s using frost-tolerant varieties of grain, choosing paddocks to sow more carefully, changing fertiliser inputs, having extra feed for sheep, or destocking. A lot of people just grow oats now because they’re fairly frost tolerant. Instead of getting your whole wheat crop frosted and losing money, at least you make something. If we’ve got a good head start with moisture, we can go ahead with the plan and put all the crop in. But if we have a really dry start and things don’t take off as well as they should do, then we’ll back off. We leave the worst paddocks out, and only put in the better paddocks. We consider the sheep, too: because you need feed for the sheep, you can’t put all your crop in if it’s really lean. I carry some feed on-hand to look after my sheep if they need it. If it gets worse, we scan the ewes and sell the dry [not-pregnant] ones. We might also sell old ewes in lamb if we need. No-till is the only way you can be profitable in this area. I use tines with 11 mm–wide knife points, with one pass through the soil and that’s it. We’ve grown break-even crops on 120 mm of growing-season rainfall before. I think with no-till and press wheels, we’ve gotten fairly efficient. Expenses have got greater and margins have got tighter, so we have to manage what I call the ‘1 per cent’ practices better. My fertiliser inputs go on as required rather than all up-front. I put on required phosphate when I seed, and come back with nitrogen as the crop needs it, depending on how the season’s looking. I do [plant] tissue tests to see if the crop is lacking any nutrients, then apply what’s needed accordingly. For example, this year  we had great rains and all the crops got off to a fantastic start. I gave them a shot of nitrogen at the three-leaf stage. Then it stayed wet and the crops were looking fantastic, so I gave them a top-up, and a couple of crops got another. 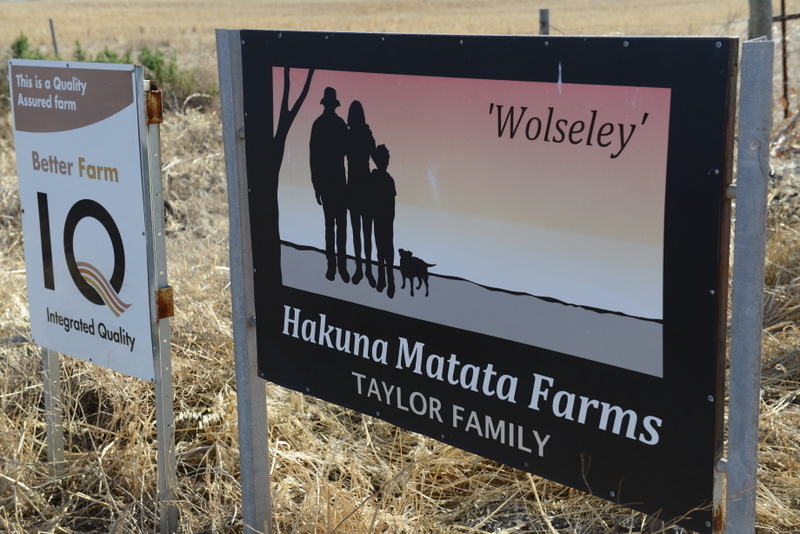 It paid off – our long-term average for barley is about 1.8 tonne to the hectare, and this year I averaged 3.25 tonnes. Even our flooded paddock averaged 2.6 tonnes. I had good soil, nothing got stressed and everything was just right for the whole year. I also do soil tests on the property every 4 years, so I’ve got a good knowledge of how my soils are going and what sort of fertilisers I need to grow decent crops. Within our sheep program, I’m really working on improving our pastures, especially by concentrating on getting rid of the weeds out of those pastures. I have a lot of clovers and medics in my pastures now, which put a lot of nitrogen into the soil. With good pastures and fewer weeds, you have fewer weeds growing in your crops. When you grow better crops, you have more nitrogen, and grow better pastures. So it works well for the whole system: both cropping and sheep. An example of my pasture improvement starting to pay off is a paddock we just harvested [December 2014]. We had a good medic stand in there last year which was about a foot high in the middle of winter, which is fantastic. And it paid off – we averaged 2.8 tonnes per hectare off it this year. 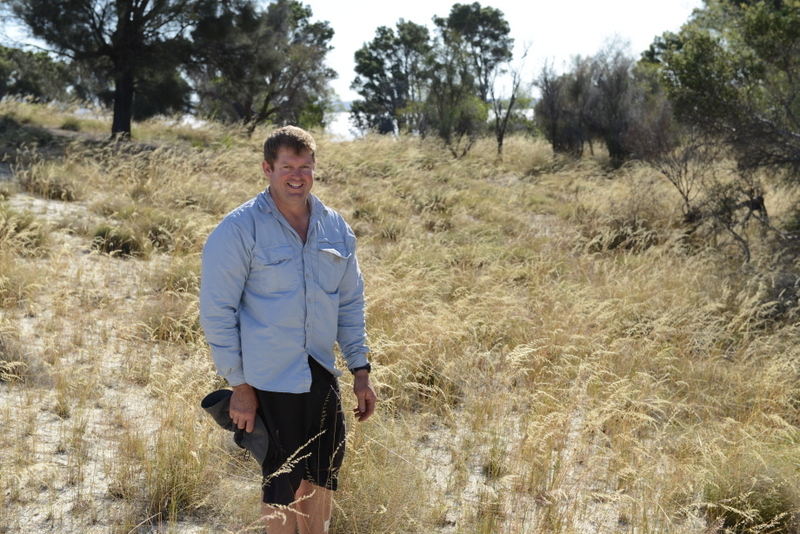 I’ve kept sheep because only two-thirds of the property is arable – 1800 of the 5000 hectares is saltbush and salt lakes. Sheep do well on this sort of country. 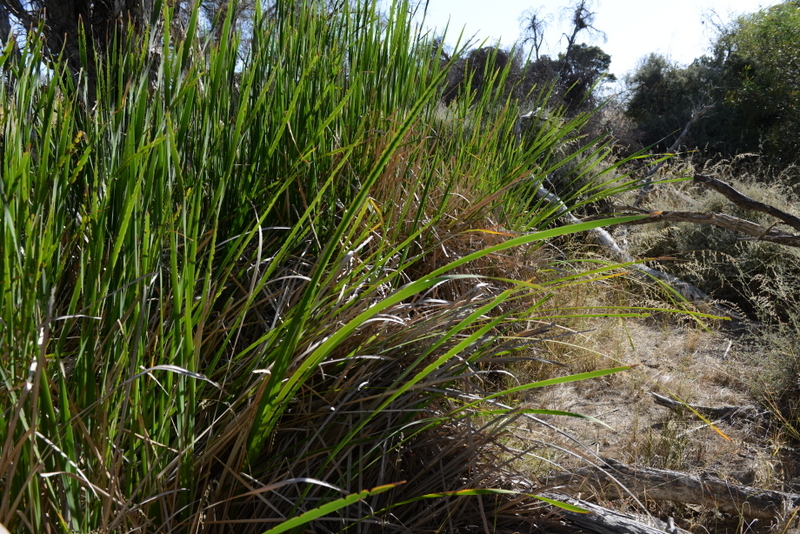 They nibble away on the saltbush and there’s grass that grows in between the saltbush as well. Our sheep are a lot of work – I get contractors in to do shearing and crutching. They’re not as prosperous as cropping this year  but, in the bad years when we’ve had droughts, the sheep get us through. I used to have wool and prime lambs – putting Suffolk or South African Merino Mutton Merino [‘SAMM Merino’] rams over Merinos – and I wasn’t making any more out of them. Having 2 different sheep enterprises was just more management for me, so I went back to just one to keep it simple – Merino sheep for wool. Then I concentrated on improving my wool quality, which has increased the return I get for my wool sales. People are farming to manage climate risks, but the risks are getting greater. We have to be really switched on and change with the times so we don’t get left behind. I think there are fewer and fewer traditional farmers who say that a changing climate is a myth – they’ve gone by the wayside. They’ve had to move on because they couldn’t afford to expand, because the margins have gotten tighter and they get pushed out. We have to be ready to adapt and change. The biggest thing that I’ve learnt is to be more efficient with our business and watch where all our pennies are going. In the 1990s we had great years with high inputs and high yields. But tough years in the 2000s forced us to become more efficient. We battled to make money – 2009 and 2010 were the worst. So, like most people out here, we play the seasons. We now have flexible inputs instead of using a ‘regular’ regime. Now we aim for an average yield, and put what we need on for that output and to maintain our soil health. Putting more and more fertiliser on is wasting money – you’re just throwing it away if you don’t need the fertiliser. I know it’s harder when you’re not making a profit. Sometimes to make changes that you need to make, it costs money, and you can’t make all the changes that you’d like to, but if you keep on plugging away and doing a little bit at a time, you will make a difference. To work out how much we’ll crop, we first start with our aim for average yield, we look at how much mineralised nitrogen we have in the soil, records of rainfall from harvest-time and summer, and our subsoil moisture using a moisture probe in-paddock. Our program has to be flexible; we like to wait for reasonable moisture if we don’t have it at the start. For instance, if it only starts raining in June, we wouldn’t even try to put a whole cropping program in. This year , with great summer rainfall, stored sub-soil moisture, and early rain in March, we’re fairly confident. Or we can seed only our ‘cleanest’ [without weeds], best paddocks which have the best chance of success, or sow short-season varieties. We look at short-term forecasts for our tactical decision-making: spraying and sowing, mostly, which rely on wind and rainfall forecasts. The 3–4 day out ones are not too bad. We look at the Bureau, WillyWeather, Oz Forecast and a 10-day one. We make decisions on that length of forecast, but outside that, they’re still hit and miss for this area. In March, we start looking at the Delta-T forecasts [wet-bulb air temperature]. When that gets really hot, we have to be careful and stop spraying – the plants can be under stress and the chemicals won’t work – it would be throwing money away. We don’t look at multi-week forecasts here – the Bureau has talked to us about how difficult this place is to forecast for that time frame. We don’t rely on a wet seasonal forecast, and don’t rely on dry ones either. They aren’t accurate enough to make decisions on, either way. The way I think of our soil is that it’s where we make our money from, so if you don’t look after your soil, you’re not going to be farming. I’ve really ramped up our soil liming in the last few years, because our soil pH is declining – we knew from soil testing. I lime every year, now, and spread a bit of gypsum as well, to stop the clay from binding up; it gets very compacted and hard. It makes a huge difference – we see results in increased yields. I had a soil-moisture probe on my farm this year  because we wanted to want to know how the soil reacts to water and its water-holding capacity. Not a lot of work has been done classifying these lake-bank soils. The probe was paired with a Yield Prophet site. We’ll collect that data and see how the soil’s water-holding capacity relates to the yield with the available nutrients in the soil, and the nutrients that were added. This year  was unusual because it was so wet – an average year’s data would probably be more useful. This is especially important because these paddocks are all going into crop again next year. I have also planted trees on-farm to stop wind erosion, give the sheep shelter belts and help reduce the water table. 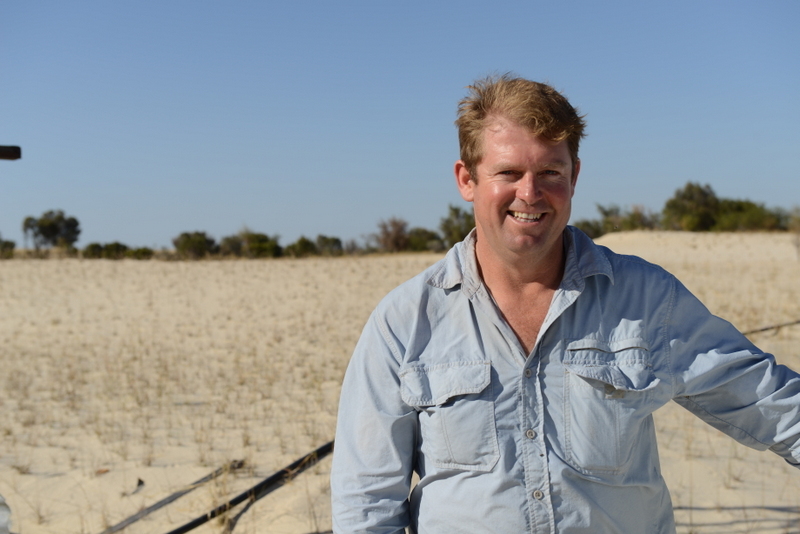 It’s worked well for stopping the wind erosion – that’s probably been the biggest benefit. The MCV Climate Champion program is a fantastic network. It’s incredible seeing what some of the people do, how they’ve adapted their farms and the changes they’ve made to adapt to their climate. I’ve learned a lot from other farmers, scientists and experts. For instance: [Climate Champion farmers] Mark and Andrea Hannemann’s water-harvesting scheme. It’s an eternal source of water for them, in their dry climate – similar to what we experience here – and now they will always have water. You can look at these ideas and learn from other people. All farmers talk to each other about this and that, and pick up a lot of little ideas. I hope I’ve shared a little bit of knowledge and helped a few people. I’m also involved in a group at Lake Grace we started about 5 years ago: the Lakes Information & Farming Technology (L.I.F.T). We’re fairly open about what we do, and learn from each other’s mistakes – it’s a good group. We do trials every year based around frost, non-wetting soils and other problems we have with farming. I like to see trials and data on new varieties before I take any new ones up. I generally wait a year or two to see how other people go, then I’ll start growing it.